As the first real cold front sweeps into the area we find our Fishing Charters in Ft. Lauderdale on some days struggling to produce good numbers but current situations have allowed us to fish on some days (not all days) productive bottom spots and also position ourselves on beautiful color change current edges that have yielded some good sized fish for our clients here aboard the Marlin My Darlin. Only one day of ridiculously strong south current since our last report that limited our choices on that day. 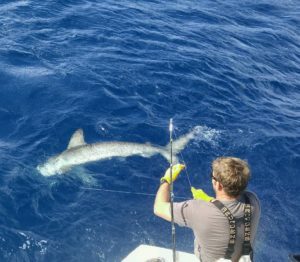 Reasonable current situations have allowed us to visit and fish deep water wrecks that have produced big fish for our anglers, which has been a blessing as overall the fishing has been off. 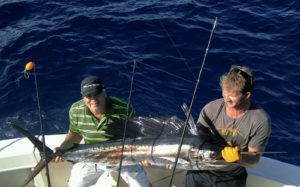 One good trolling afternoon produced 3 Kings, 3 Cero Mackerel, 3 Blackfin Tunas, a couple of Cudas and a half dozen medium Bonito. Other than that afternoon ( in which we also deep dropped and caught a couple of Golden Tiles) trolling has been weak. 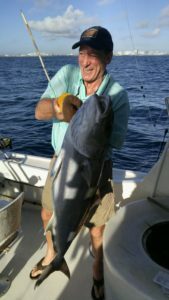 On the cheerful side of things wreck fishing with the moderate current has been offering good fish with big Amberjacks and Almoco Jacks taking live baits. 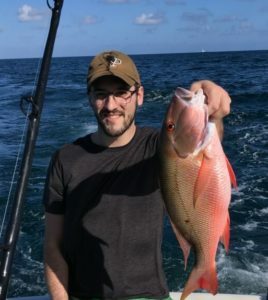 Mutton Snappers here too, but the Black Groupers have backed off. 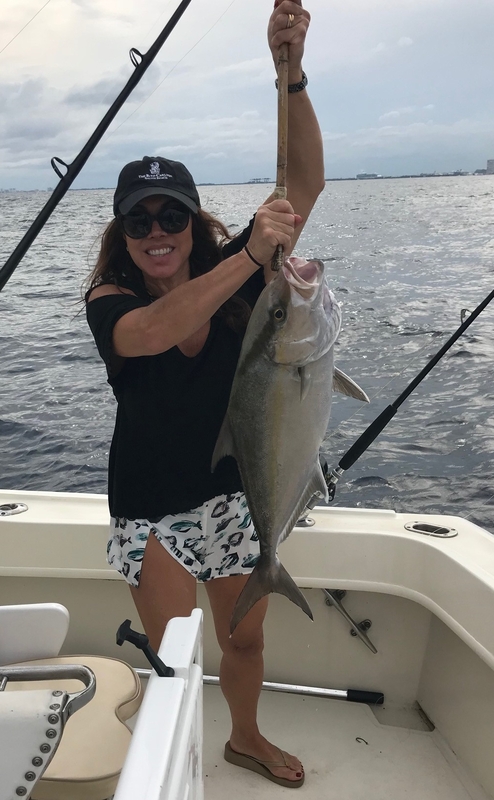 Live Bullett Bonito of less than 12 inches are a bait of choice and draw good bites. Pilchards get a Mutton Snappers attention. This is fishing very dependent on reasonable current situations. Some very nice edges have formed and Sailfish are on them. Some Mahi-Mahi moving down these color change edges too, but few in number. We all very much expect more Sailfish opportunities with this latest ( and 1st real) cold front’s arrival. Lows around 50 on the coast are forecast thru Tuesday and northeast winds. Record highs various cities nearby as the temperatures got into the upper 80s on the southernly wind Friday. Now looking at possible (expected) record lows. We are so ready for the cooler weather. See you on the edge, and here’s to tight lines and good fishing with this frontal system.